Yesterday while we were on the ferry headed to Seattle to go to the new and improved Museum of History and Industry (MOHAI), I spotted some porpoises playing in the ferry’s wake. 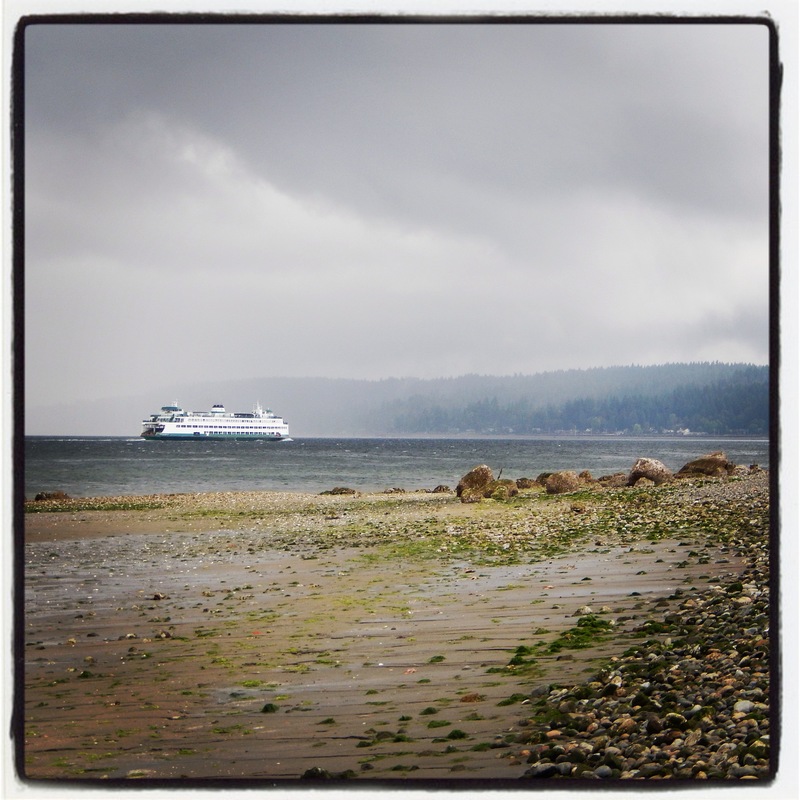 I have lived here most of my life and I have never seen porpoises in the Puget Sound. The ferry worker commented that it is fairly common to see them during the extreme low tides and that today’s tide is a -3, the lowest tide of the year. Shoot! A -3 and we’re not home to scour the beach? Ugh! 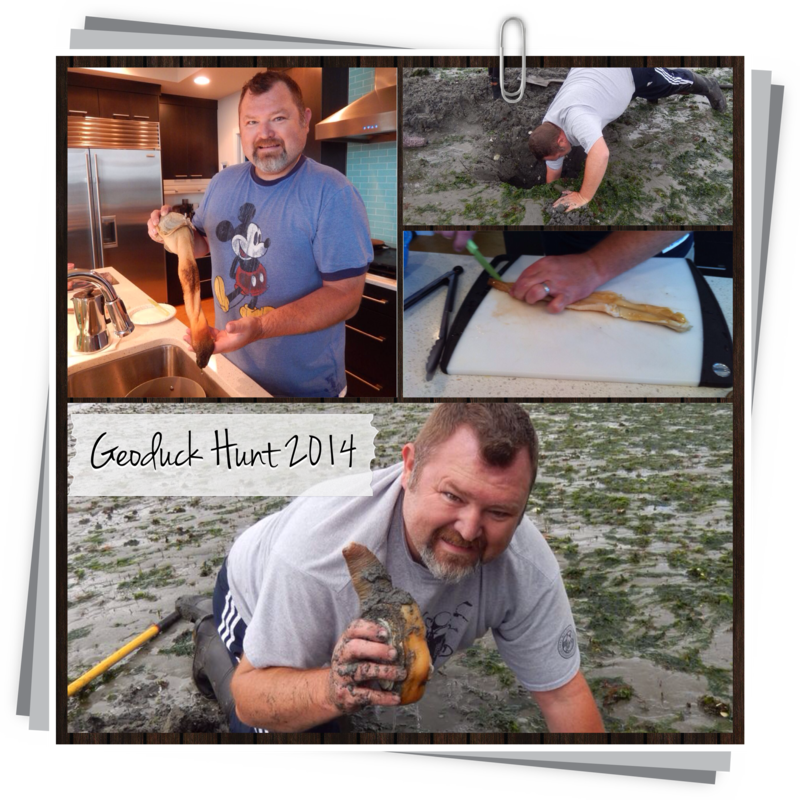 Luckily, today’s tide is almost as low which makes it the perfect time for a geoduck (say: gooey duck) hunt! 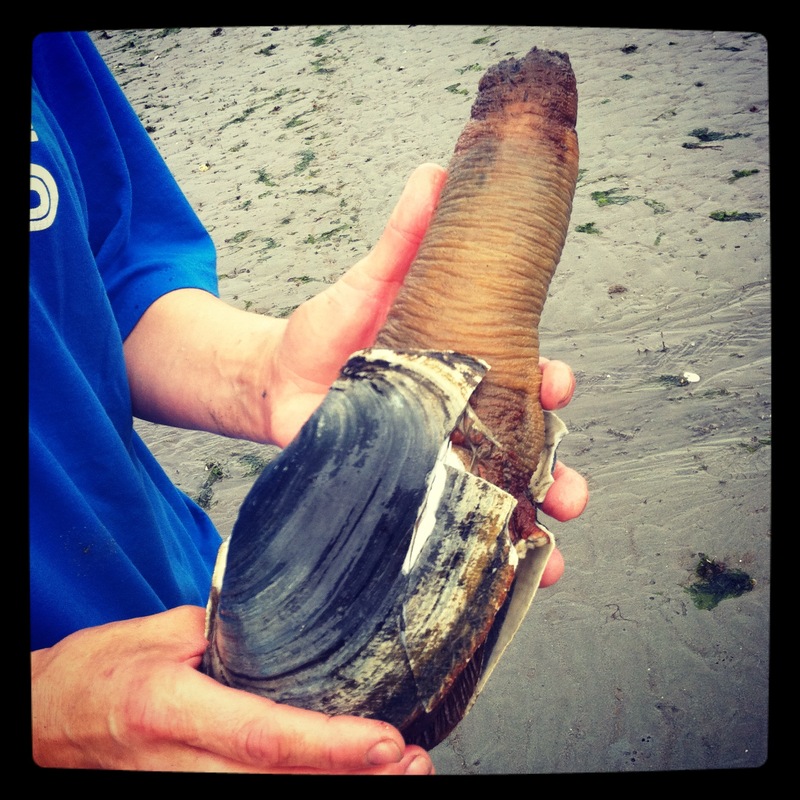 Geoducks are a giant species of clam that are native to the northwest coast of the United States and southern British Columbia, Canada. They are also one of the longest living animals on earth. I have read that some of them live up to 100 years or more. They look like a giant clam with a very long phallic neck. Geoducks spend their entire lives buried in the sand and stretch out their long necks, sometimes up to 3 feet, to the surface. Jeff set out about an hour before low tide to search the beach for geoducks to dig. He marked his targets, the tips of their necks, and began to dig. 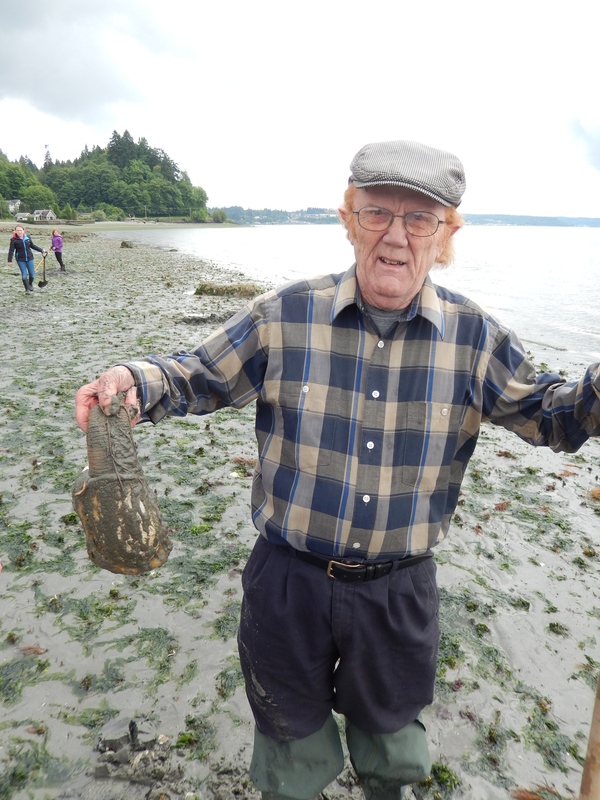 Shortly after, Herb arrived with his shovel and retrieved the first of the day! Not long after, Jeff dug up three more just in time for the rain to come and put a damper on our hunt. Geoducks taste like a super clammy clam. They are popular in Japanese cuisine served sashimi style. Jeff blanched them, removed their shells and the sheath from their necks before gutting them and cleaning them. We’ll use the meat to make a nice hearty chowder for our Fourth of July celebration. 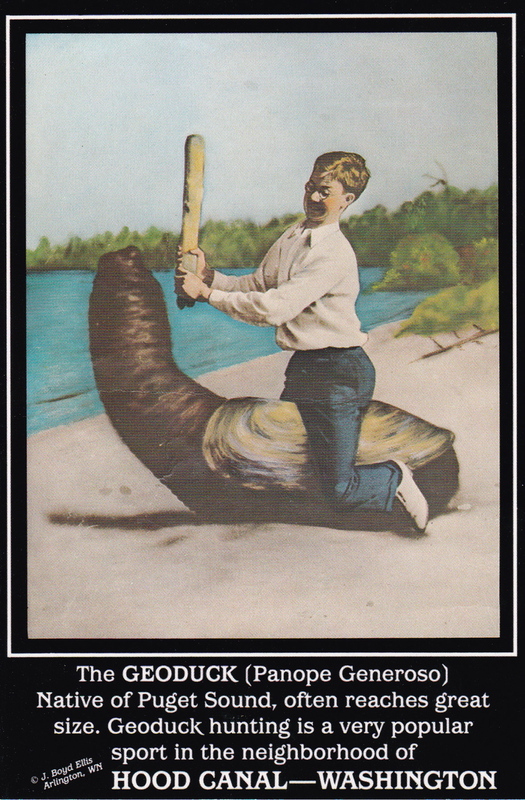 The Evergreen State College in Olympia, Washington (my first college) proudly boasts “Speedy” the geoduck as their mascot. Read about it here.